Let Precor be your frontline against fleas. 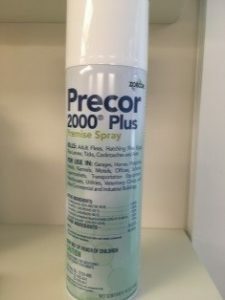 Instead of bombing your entire home and putting chemical where you don’t need it, Precor provides a targeted approach to flea eradication. This aerosol spray can be applied effectively to walls, furniture and floor carpeting and leaves a residual layer of chemical that will continue to work against fleas for up to six months. Helpful Hint: Some of the best flea treatment you can get comes in the form of your very own vacuum cleaner. Being vigilant about vacuuming before and after your flea treatment, changing the bags often is the most powerful weapon you have in the fight against fleas. This insecticide bomb is superb at providing effective blanket extermination for large areas. One six-ounce bomb treats up to 5000 cubic feet of space. 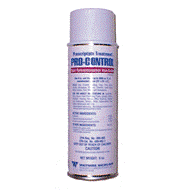 Pro-Control’s product is particularly good for basements, garages or attics with low human and pet traffic. The pyrethrin-based bomb provides excellent coverage with little effort; the can is simply activated and left alone to do all the work for you, fogging the space with chemical. Helpful Hint: Being vigilant about vacuuming before and after treatment (changing the bags often) is the most powerful weapon you have in the fight against insects such as spiders, beetles and fleas.